Benchy Armada - 25 Different Materials! The Zortrax M200® performs auto-sensing of bed height by means of direct electrical contact between the nozzle and plated contacts on the bed surface, and an initial height offset supplied by software. This is a simple and inexpensive system, but corrosion, plate damage, plastic on the nozzle, and other factors can cause variations in initial layer height, which in turn can affect print quality, adhesion, and ease of raft removal. The small connector on the bed is easily damaged, and the plating on the bed contacts wears over time,. In extreme cases, contact or wiring failures can cause "crashing" of the nozzle into the bed, damaging the bed, nozzle, or both. And of course, the software-specified initial layer height necessitates use of a mechanical shim in order to increase the distance when printing with PLA and many other materials. The Z-Sense Bed Height Control installs in minutes with no permanent modifications to the printer and eliminates all of these problems. It eliminates initial layer height variation, bed wear, nozzle damage, and the need to use a shim, while permitting printing on any build surface - glass, BuildTak™, PEI, tape, whatever you like. The disadvantage of Z-Sense is that since it does not do automatic bed sensing, it should be recalibrated each time the nozzle, hot end, or build plate thickness is changed. Calibration, however, is quick and easy. Use Any Build Plate. Since the Z-Sense does not require electrical contact with the build plate, you can use any plate or material you wish. Consistency. The initial bed height is set with exact repeatability from print to print. No shim required. The initial layer height is set by the adjustment on the Z-Sense, so you no longer have to use a shim at the start of every PLA print. No more waiting for the printer to heat up - just click "Print" and walk away! Easy Setting. Z-Sense incorporates an indicator LED to make setting the initial height quick and easy. Other printers using a manual height adjustment require a time-consuming trial-and-error process to set the initial layer height. With Z-Sense you simply position the bed at the desired initial height, then turn the adjustment knob until the LED comes on. Easy Adjustment. Once calibrated, fine adjustments to optimize flow or adhesion for various materials are easily made with the Z-Sense knob: each quarter-turn of the knob changes the initial layer height by 125µ (0.125mm). Easy Installation. Holes for mounting Z-Sense are already provided in your M200 chassis, and all necessary hardware is supplied with Z-Sense. 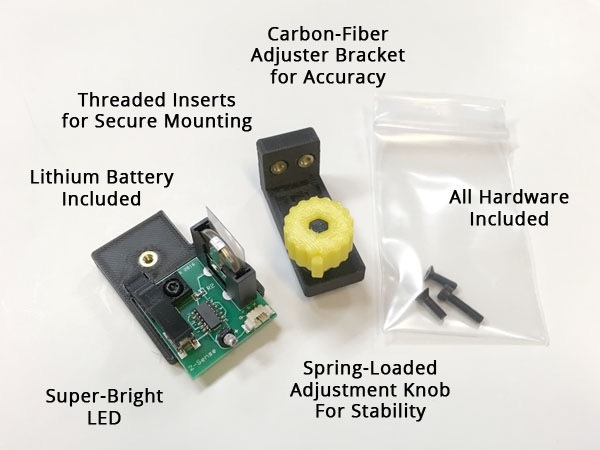 Attach the adjuster assembly to the rear wall of your M200, attach the sensor PCB to the Z-axis stage, then unplug the sensor cable from the bed plate and plug it into the Z-Sense PCB. Click to see the complete installation and calibration instructions. No Damage to Bed or Nozzle. When the initial layer height is adjusted greater than the standard height (as with PLA), the nozzle will not even contact the bed during sensing. Less Wear on the Sensor Cable. Removal of the build plate for cleaning or other maintenance normally requires unplugging the sensor cable's delicate connector from the plate. With Z-Sense there is no connection to the perforated build plate. Compatible with the M200 Auto-Leveling Firmware. If you ever want or need to use the firmware auto-leveling, just unplug the sensor cable from the Z-Sense PCB and plug it back into the Zortrax bed plate.